The Rental Assistance Demonstration was created in order to give public housing authorities (PHAs) a powerful tool to preserve and improve public housing properties and address the $26 billion dollar nationwide backlog of deferred maintenance. RAD also gives owners of three HUD "legacy" program (Rent Supplement, Rental Assistance Payment, and Section 8 Moderate Rehabilitation) the opportunity to enter into long-term contracts that facilitate the financing of improvements. The properties below are RAD converted properties and are now online. Beigger Estates is a RAD (Rental Assistance Demonstration) Development for families. This community has 119 units including 87 - two bedroom units, 22 - three bedroom units, and 10 - four bedroom units. This property opened in 1986 and was named in honor of Jack Biegger, former Commissioner. The single-story units are newly renovated and feature new appliances, cabinets, floors and fixtures. They also include evaporative coolers and storage space. The property offers ample parking, open green areas, playgrounds and an EOB WIC (Women Infants and Children) Center. The Whitney Community Center is conveniently located across the street. It is close to shopping centers, banks, schools, and bus routes. This eastside property is west of Boulder Highway at Missouri, just south of Tropicana. The management office is located at 5701 Missouri Street, Las Vegas, NV 89122 and staff can be reached at: (702) 413-6440. Espinoza Terrace is a Public Housing development for seniors. This community has 100 units including: 60 - efficiency units, 36 - one bedroom units, and 4 - two bedroom units. This property opened in 1973 and was the first public housing development for seniors. It was named in honor of Art Espinoza, former Board Chairman and Vice Chairman. The walk-in units feature air conditioning, carpet, security screens, emergency call button in the bathrooms, and patio/sitting areas in the courtyards. The well-lighted property has handicapped parking, wide open green areas with mature landscaping, paved walk-ways, barbeque pit areas, a laundry facility and an on-site beauty shop. Small pets are also accepted. This Henderson property is located on the RTC fixed route bus system. A special Henderson route (#702) is available on Monday and Thursday designed to meet weekly shopping needs. The Fremont Medical Center is located down the street and St. Rose Domincan Hospital is also in close proximity. There is a large community room with a ping-pong table, piano, shuffleboard, kitchen area, library with books and puzzles. A very active Resident Council coordinates various events such as bingo games, potlucks and a newsletter. The property is located east of Boulder Hwy, south of Lake Mead Drive at Van Wagenen. The Managment office is located at 171 Van Wagenen, Henderson, NV 89015, and staff can be reached at (702) 477-3315. This is a RAD (Rental Assistance Demonstration) Development for families. 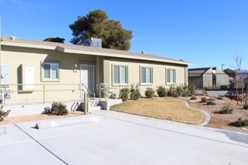 This community has 100 units including: 30 - two bedroom units, 34 - three bedroom units, 26 - four bedroom units, 10 - five bedroom units, This property was placed into service in 1971 as the first family Public Housing offered in Clark County. The site was named in honor of Albert M. Landsman, former Board Chairman. The single-story units feature blinds, laundry hook-ups, air conditioning/evaporative coolers, private driveways and entrances, back yards, and storage space. The property offers plenty of parking, open green areas with mature landscaping, playgrounds, an EOB Center (Daycare), a WIC (Women Infants and Children) Center and participates in the Henderson Community Policing program. This Henderson property is located east of Boulder Highway at Major and Burkholder. It is close to shopping centers, banks, schools, and bus routes. The management Office is located at 750 Major Street, Henderson, NV 89015, and staff can be reached at (702) 476-3322. Vera Johnson Manor B is a 112 unit community of two to three bedroom sizes. The community is within walking distance to a local grocery store, fast food restaurants, pharmacy and an elementary school. The management office is located on site at 503 N Lamb #1, Las Vegas, Nevada 89110 and staff can bed reached at (702) 501-8767. Rose Gardens is a 120-unit Senior Public Housing Development located on 1731 Yale Street in North Las Vegas. Rose Gardens consists of 60 zero-bedroom studio units and 60 one-bedroom units. The Development is open to seniors. Here, there is an onsite laundry facility, a newly renovated recreation hall, an active resident council, and community garden. The management Office is located at at the same address 1731 Yale Street, North Las Vegas, Nevada 89030 and staff can be reached at (702) 410-1292.